← How to tell if that new research study your friend posted on Facebook should be shared…or deleted. Righty-ho so let’s break down this CNN article by Wayne Drash which claims “Drinking non-cow milk linked to shorter kids, study suggests”. The plan here is to assess some research about a very specific effect of cows milk on the height of young children so I’m not going to go into a bunch of other stuff around cows milk – just addressing the points of this research. So let’s review. Firstly, we have to look BEYOND the article to the research itself. The only link the article had was to the American Journal of Nutrition – there was no original source link but I found the original research paper by searching “Jonathon Maguire non-cow milk” (the name of the researcher and a keyword on the research topic) on trusty ol’ Google. Sometimes you can take the full title of the abstract and do another Google search and find the full version posted somewhere (e.g. Association between noncow milk beverage consumption and childhood). Very often I can find it on Researchgate which I have access to. Unfortunately I tried that in this case and it hasn’t been around long enough for any other sources to be hosting the full version. If you’re a uni student, your uni email should give you access to a whole host of credible journals and so you’ll generally be able to access the full version. Ok so for now we’ll have to work with what we’ve got – the research abstract. So we need to approach with caution. The abstract says its a cross sectional study of kids enrolled in an existing research program called the “Applied Research Group For Kids”. I looked that up and found this: https://www.ncbi.nlm.nih.gov/pubmed/24982016. Looks pretty solid and as a longitudinal study, they’re basically asking a bunch of questions on a regular basis so participants aren’t having to remember what they did ages ago. The program is also listed on the US National Library of MedicineNational Institutes of Health so I feel pretty safe about this. Not really relevant here as its a longitudinal study which is just collecting a bunch of different data over time. The sample size is 5,034. This sample size is ok but I would use caution in applying these results more broadly because these are 24-72 month old Canadian kids, the majority of them are of caucasian background. Now given that 75 percent of African Americans and American Indians and 90 percent of Asian Americans are lactose intolerant – lactose intolerance develops in Asian and African genetic heritage in much higher rates than caucasian – this study may not be applicable in those cases. As a bit of background to lactose tolerance/intolerance, basically when you’re a baby you have a bunch of enzymes called “Lactase” which essentially helps your body to break down the sugar molecules in milk called “Lactose” and some of us don’t keep producing those enzymes once we’re done with breastfeeding! (some more info on this here). Nope this was published in a good journal. Here are the results for the journal’s credibility. This is really the biggest problem with this whole study. This is the assumption that the researchers have made “Cow milk consumption in childhood has been associated with increased height, which is an important measure of children’s growth and development”. That is true, but it’s also a misleading statement because they are not defining how much height is good. Saying that “height is an important measure of child development ipso facto a taller child is a healthier child” is a fallacy. This is like saying “Vitamin A is good for me so more is better”. Well, that’s not true. Too much Vitamin A can cause dizziness, nausea, headaches, coma and oh yes…death.Now I’m sure these researchers have good intentions, but they seem to have ignored previous research as a baseline or benchmark for their assumptions. Sure, western society holds up males in particular as being “better” for being taller. But does that mean they’re healthier? Nope. All evidence points to shorter being healthier. This is info from the main US govt health site on this topic https://www.ncbi.nlm.nih.gov/pmc/articles/PMC1071721/. This overview of research to date on the topic is well worth the 15 minute read if you’ve got the time. Seriously, don’t take my word for it. Furthermore height is the main mediator of higher risk of hip fractures later in life for men – and is determined by their earlier intake of milk. Here is the original study abstract for the above statement here: https://www.ncbi.nlm.nih.gov/m/pubmed/24247817/. Is it true that soy and almond milk have perceived health benefits (that may, or may not be true depending on what research has shown vs what is widely believed). Yes that’s pretty true. Gee…that doesn’t seem right…have they averaged out protein across Soy and Almond Milk perhaps to give “nonmilk” drinks an overall lower protein number? Because by my lay-person eye it looks to me as if they have the same amount of protein. Of course milk may have other nutrient soy does not have and I’m not disputing that but why say something when it’s not true across the board? Surely you’d make sure you were looking specifically at who drank almond milk vs soy milk as a non milk alternative and understand the difference between both. Let’s ask a more important question. Is it fat OR protein that contribute to height? Erm, neither exactly. Protein is part of it, but it’s actually calcium as well as the Insulin-like Human Growth Factor hormone that is present in cows milk at a much higher dose than that of human breast milk which is thought to contribute to height gain. Why are we only doing studies that suit a caucasian genetic makeup? So what does all the above mean for this study ? Well, the findings of association itself are not wrong. But the assumption that is being created in the way the introduction is phrased are disturbingly misleading. What should happen next? As the abstract itself states at the end “Future research is needed to understand the causal relations between noncow milk consumption and height”. This is absolutely true because milk consumption (or the specific properties within it) may not be the cause of different height growth. Epigentic forces could be contributing to the outcome here. i.e. mothers and fathers who drink noncow milk and plan to give noncow milk to their children could have a variety of other different diet habits that have a different impact at the point of conception and methylation. Recent epigenetic research shows for instance that mothers who take less than around 300 grams of protein per day during the early stages of pregnancy alter the DNA methylation status at the site of the Vitamin E receptor gene and this contributes to the child’s percentage fat mass later in life. I wonder, does it impact their height too? Because if it does, this could be a critical factor in helping to explain this Canadian research as having an epigenetic cause. It is possible that women who choose to drink noncow milk, may also have a lower protein intake in general which in turn contributes to these epigenetic changes upon conception! PS that is just a completely untested hypothesis of mine…but it’s not entirely crazy I don’t think.. But furthermore, future studies should first seek to establish what is considered to be a bottom level AND top level healthy height in childhood through to adulthood. And ensure that studies around the benefits for shorter adult height are fully considered in this assessment. Only then is it really possible to start drawing insight around what types of foods/drinks to give children and give them the best chance of health throughout their lives. 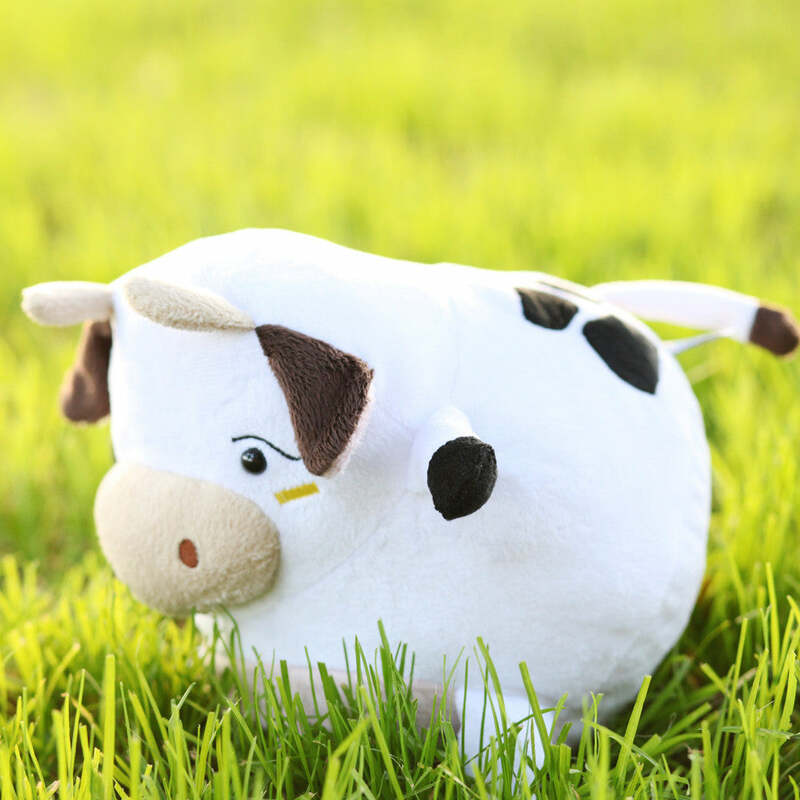 Lastly, while trying to find images for this post I came across the cutest awkward cow toy I have ever seen. 😀 I think I’m going to buy one! This entry was posted in Health, Scientific Research, Uncategorized, Vegan and tagged soy milk, Vegan. Bookmark the permalink.